You created a Java class to model the data and operations of an Employee. Now suppose you want to specialize the data and operations to describe a Manager. The Manager class shown here closely resembles the Employee class, but with some specialization. A Manager also has a department, with a department name. As a result, there are likely to be additional operations as well. What this demonstrates is that an Manager is an Employee- but an employee with an additional features. In an object-oriented language like Java , subclassing is used to define a new class in terms of an existing one. When an existing class is subclassed , the new class created is said to inherit the characteristics of the other class. This new class is called the subclassand is a specialization of the superclass. All of the non-private fields and methods from the superclass are part of the subclass. So in the diagram, a Manager class get empID , name, SSN, salary, and all of the public method from Employee. It is important to grasp that although Manager specializes Employee , a Manager is still an Employee. The keyword extends is used to create a subclass. 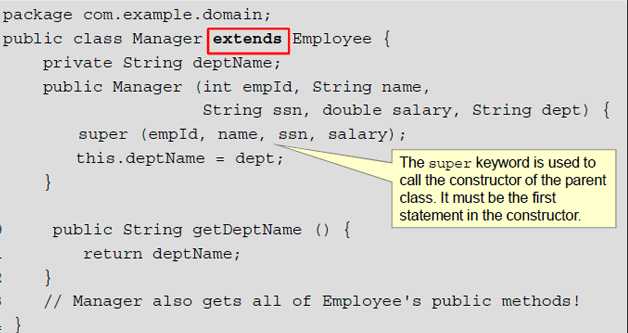 The Manager class , by extending the Employee class, inherits all of the non- private data fields and methods from Employee. After all, if a manager is also an employee, then its follows that Manager has all of the same attributes and operations of Employee. Note that manager class declares its own constructor. Constructor are not inherited from the parent class. 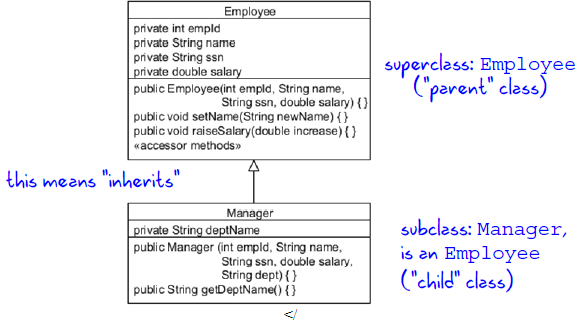 Every subclass inherits the non-private fields and methods from its parent (superclass).However, the subclass do not inherit the constructor from its parent . Its must provide a constructor. "Constructor declarations are not members. They are never inherited and therefore are not subject to hiding or overriding".